“In the long run, patrimonial capitalism is the only kind that can exist.” The noted scholar of inequality (Capital in the Twenty-First Century, 2014, etc.) looks at recent events through an economist’s lens. These columns from Libération, the leftist newsmagazine founded by Jean-Paul Sartre, span the years 2008 to the near-present and focus largely on European matters, especially the crisis of the Eurozone in the last few years and its predecessor meltdown in the wake of the global financial downturn of 2007. This odd period, Piketty remarks, is characterized by a decline in income even as wealth increases markedly—a seeming contradiction but all of a piece with how fortunes are amassed and transferred. 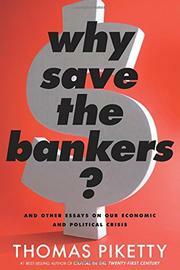 Even though “one certainly senses mounting public exasperation with the explosion of supersalaries for executives and traders over the past thirty years,” the author finds good economic reasons for the bailout of banks and bankers that followed the earlier crisis. His arguments often stray into moral realms, as when he decries the “obscene salaries” that accompany “senseless risk-taking behavior” on the parts of players within the financial system. Piketty also grumbles that getting decent worldwide governance of the financial system “will probably take many more crises.” Many of his pieces are comparatively easy to follow for readers without much knowledge of economics, especially when he picks apart topics that defy classical economic logic (“Do you understand anything about the carbon tax?” one piece from 2009 begins); in this he resembles Paul Krugman, who similarly writes clearly on complex topics. However, many of the other pieces require at least some knowledge of European affairs and of economics alike, as with his excursus on how Italian public debt is constructed. If reading Piketty’s columns brings back bad memories of tough times of the recent past, it also helps make sense of recent financial history. Just be prepared for a mental workout.